An unfortunate side-effect of getting older is that other commitments begin to cut into your brewing time. Twenty years ago I brewed an astounding 40 to 50 batches of beer each year. Now, between work, owning a small farm, my wife and my child, I’m lucky if I can squeeze in a dozen brew days each year. That’s probably good news for my liver, but it is otherwise a sad state of affairs. Resolved to address this deficiency, I planned what will either be a master-stroke of a brewday, or a huge waste of time effort. Namely, I came up with a plan to brew three beers out of a single mash. Normally I post both my recipe, brewday notes and tasting notes as a single post. But part of this “master plan” is to have beers that will be ready at different times, so in today’s post I’ll describe my approach, recipe, and brew day. As the beers finish, I will put up tasting note posts to let everyone know how the beer turned out. My brewery seems to get smaller every brew! Ultimately, my choice of beer styles came down to a radler, berliner weisse and saison. All three of these are typically made with a pilsner & wheat base, and the production methods of each are fairly compatible. I designed a base recipe for both a radler and saison. 1.054 gravity, 80:20 pilsner:wheat malt, a modest bitterness (24 IBU) and some Spalter hops for character. Getting two beers out of this is easy – split the wort and ferment the radler base with a neutral yeast and the remainder with a saison yeast. To add a bit more pizzazz to the saison, I also decided to add a dry hop addition using crystal hops. But where does the Berliner come in? This was my potential stroke of genius – Berliners are also a pilsner/wheat base. But they are of lower gravity than the saison/radler, and often brewed without hops. Thus, a Berliner could be prepared by diluting the pre-boiled wort in water, which would then be kettle soured. Vola, three 5-gallon batches of beer from one 10-gallon batch…but for one flaw. My original plan was to produce an ~1.035 OG Berliner wort by diluting the pre-boil wort 25% with water. But that involved collecting ~5L more wort than my kettle can hold. And because I needed to pastureize the Berliner wort, it was critical the wort fit into the kettle. But the solution was simple. Dilute the wort 1:1 with water, then bring up the gravity with DME. The first step is the obvious one – mash in. 7.5 kg of Pilsner Malt and 2.5 kg of Wheat Malt were mashed at 66.7 C for 60 minutes. The mash was sparged, collecting 50L of wort (literally leaving ~1 cm between the top of the wort and the top of the kettle). The wort was heated to 80C, while circulating the wort through my brew pump. This sanitised both the pump and the wort. While the wort & pump were heating, I heated 650 g of light DME to 80 C in some water, and added that to cool water in a carboy, for a final volume of ~10L. I carefully pumped ~12L of pasteurisation -temperature beer into the carboy, carefully directing the flow of wort so it was pumped directly into the water. This avoided shattering the carboy by preventing hot wort contacting glass. As luck would have it, this led to wort at 38C; just 1 degree warmer than my desired souring temperature. The rest of the brewing process was straight-forward. I brought the remaining 38L of wort to a boil and added 25g (23 IBU) of Warrior hops for an hour. Irish moss was added 15 minutes before the end of the boil, and I performed a 20 min whirlpool with 28 g of Spalter hops at flame-out. 10L of wort was transferred to a fermentation pail, and the remaining 23L to a carboy. The radler is a quick-turn around beer, intended to give us something light and refreshing to enjoy during the high heat of August. 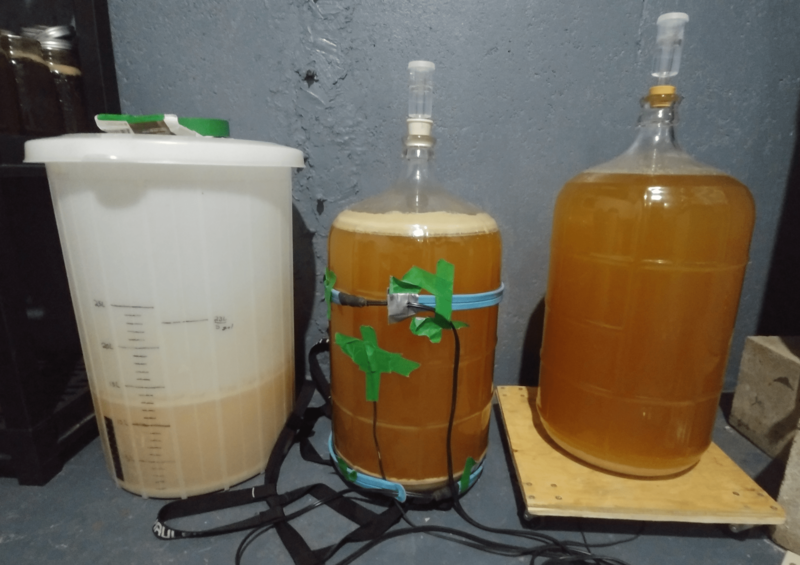 I pitched a healthy amount of Wyeast 1007 (German Ale), and it is currently fermenting at cellar temperature (~17 C). This base beer should be ready for radler-fication in as little as 10 days, but given my schedule this month, it’ll probably be radlerified on day 16. Radlerfication is a simple process – the 10L beer is transferred to a keg and 2.5 tsp potassium sorbate + 0.25 tsp potassium metabisulfate (pre-dissolved in a small amount of water) added. This stabilises the beer so that additional fermentation does not occur. Next, frozen juice concentrate (strained to remove pulp) is mixed in, along with enough cold water to bring the total volume up to 20L. This is then force-carbonated and is ready to go. I’ve tried different juice mixes in the past (examples: 1, 2), and while I normally prefer a less-sweet version, this time I’m going for a sweeter and pop-like finish. To achieve this I am adding 2 cans of pink grapefruit juice concentrate, 1 can of lemon-aid, and 1 can of unsweetened grapefruit juice. Unlike most saisons, this recipe was formulated as a quick turn-around beer. It is fermenting with the Mad Fermentationists Saison Blend, which is reputed to give a nice saison character quickly at warmer temperatures. The goal is to have this beer ready for the dog days of summer and early fall – i.e. I should be kegging it mid-August. To draw out more saison character I under-pitched this beer and fermented it at cellar temperatures for 4 days. At this point the Berliner no longer needed the brew-belts, so I transfered them to the carboy of saison and began ramping the temperature. The beer was at 19C when I started ramping, and I ramped 1C/day until I topped out at 27C. The plan is to hold this temperature for a week, then ramp the beer back down to cellar temperatures, again at 1C/day. It will then be held at cellar temperature until kegging day. The Berliner is on much the same schedule as the saison – e.g. it is intended for late summer enjoyment, athough a portion may be laid down in bottles for some longer term ageing. To start, I placed Brew belts on the The Berliner carboy, added a temperature controller, and wrapped the carboy in insulation. 5 probiotic capsules of unknown origin or content (I live dangerously) were added, and the carboy held at 37 C (98 F) for 2.5 days. At this point I pitched a small culture (~0.5L) of Simonaitis Kveik, and continued to hold the beer at 37C for an additional 2.5 days before removing the brewbelt and allowing the beers temperature to free-fall. 7 days after fermentation started I added a blend of 4 Brettanomyces yeast, which brings us up to today. The plan moving forward is to let this ferment for another 3 weeks, at which point I’ll add some apricot extract and keg 19L for immediate consumption; and the remaining 4L bottled for long-term ageing. While I’ve not yet sampled any of these beers, the concept appears to be sound, and the brewday went off without a hitch. Excitingly, for me, is that my brewday only ended up being 30 minutes longer than normal – but produced 3 times the beer I normally make, in 3 distinct styles.